The Houston Medical Center is a mecca for medical advancement. Two medical schools and multiple hospitals attract the best and brightest medical practitioners from around the world. The operating rooms in the medical center cater to surgeons that perform hundreds of difficult procedures each week. But not all surgeries go smoothly, and in some cases, surgical errors do harm to the patients on the operating table. Does this really happen – a surgeon operating on the wrong body part? It absolutely does, and it occurs every year at hospitals in Houston and around the United States. 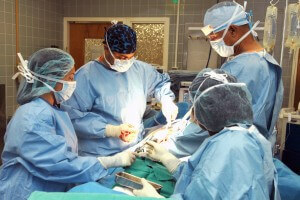 Surgeries are a team effort, with the surgeon playing a small but prominent part in the process. Nurses, surgery technicians, anesthesiologists, and hospital employees all have a role. A lack of communication or missed information can lead to the surgeon cutting on the wrong arm, wrong leg, or even removing the wrong internal organ. These surgical errors constitute medical negligence, and often leave the patient prepared to file a Texas surgical negligence claim. The conclusion of a surgery is an important time. All members of the surgery team are preparing the patient for transport to recovery. In this rush to finish a procedure, instruments and tools used during the surgery can go unaccounted for. Sewing up a patient and leaving behind an instrument can happen when the surgery team fails to count all items by double-checking the pre-procedure inventory. If you are recovering from a procedure and have any of these signs, you may be suffering from a postoperative infection caused by dirty equipment. Contact the Houston surgical error lawyer team at Richard J. Plezia & Associates to schedule an appointment. You may have a Texas surgical negligence claim. More hospitals and surgeons are turning to robotic equipment as the primary tool for operating room procedures. These high-tech tools are used by the surgeon and offer a wide range of benefits. Robotic surgeries are often less invasive, more precise, faster, and lead to a quicker recovery time. Like any job with specialized equipment, the operator must be skilled and trained to use the tool. Surgeons that schedule robotic surgeries without the proper training can very often commit medical negligence. Surgery errors with robotic equipment can be dangerous and lead to patient injury and wrongful death. Surgeons are educated and trained to heal and fix patient health issues. But there are surgeons that neglect safe methods and make mistakes. If you or a family member has been harmed during surgery, contact Richard J. Plezia & Associates for a Texas surgical errors claim consultation.